Michael Aspel and the team survey heirlooms at the last working Victorian pottery in England, at Middleport in Staffordshire. A portrait of William Gladstone puts in an appearance. Browse content similar to Middleport Pottery. Check below for episodes and series from the same categories and more! without the aid of Staffordshire pottery towns. the Mother Town of the six that form the city of Stoke-on-Trent. with competition flooding in from the other side of the world. few metres of water to get here. pottery of Middleport the home of Burleigh ware. and good to its workforce. passing of the years very little has changed in the production process. Pottery from here has been shipped all over the world. come across young William and Frederick planning their next line. An entry in Leigh's day book gives a hint of his philosophy. "Be frugal, that which will not make a pot will make a pot lid." after other potteries closed nearby. Burleigh's speciality is something called underglaze transfer printing. It's a skill that's been practised for over 200 years. in the world still using it. the company very nearly came to a disastrous end. they were in financial difficulties and the receivers were called in. bank account stepped into the breach and mounted an audacious rescue bid. will find their way home today. fingers, the weather forecast isn't good but when did that ever stop us? at Middleport pottery for over 50 years, so they were all his. and they're just a little collection of things. Was he a potter here, what was his job? He was a warehouse master. Cross-warehouse. -And these things I suppose he just acquired while he was working here. were produced here in its greatest period during the 1930s, '40s, when they really understood glazes. because it shouldn't be in these colours. in a very tame colour, but here it's been brought up-to-date. When did he join the factory? that mark says it was made in the 1860s, but it wasn't. and here they produced a Victorian jug in the 1930s colours. -know the modellers and work with them? Oh, Earnest Bailey of course was perhaps the epitome of the modellers here, just a superb work, isn't he? This is one of his designs, isn't it? How much more decoration can you get in one jug? bell ringers, Oh, I see. The bells ringers Jack of Lincoln. and cast here, what 1948.
were still export only, they couldn't really be sold locally. -That's another one of Bailey's work, isn't it? It's a marvellous idea of a jug, isn't it? and there is Edmund Leigh the first chairman of Burgess and Leigh. in the family. What do you think of them? I'm not particularly keen on these two but I love this one. I think this is fun and, that's a beautiful piece of pottery and I really enjoy that piece. it's tube-lining, isn't it, drawing the patterns out in colours. or work lady because there we have the mark of Charlotte Rhead. You don't see much of the Rhead pieces on the Burleigh ware. prototype that stayed in, was given in the family, I presume. It was presented to him when he retired. What a lovely piece to be given. compared to other factories but it's growing steadily in market. £150 for an unusual jug like that. They are affordable I think. They're going to be £200, £300. Lovely bits of pottery for that, aren't they? They're great. today what are we gonna be - £400 rising. But they're going up, they're going up. These are scarce things. People are looking at them in a new way because they've got the quality. so I mean that's going to be again, I suppose £500. sort of stuck out and I asked how much it was and it was 25 pence. -So not an outrageous sum of money. and tiny diamond chips in the letter here. at what this little mechanism was at the back there? -could replace that blue plaque with a different colour plaque. 1900, 1905 - so it's the start of the 20th century. Gold, pearls, blue enamel and diamonds and you paid 25 pence. -In a fete for it. Cartier, believe me that would be one of the ultimate finds, it's not. -There are no makers marks on it at all that I can see. to be a little bit careful not to go too high with it. -be delighted to pay something in the region of £500 for it. So your 25 pence was a very good investment. -Certainly gave me a good profit then. they've been promising us rain for days and here it is on the dot. there is space in there for us to move in, so let's do it. round with, with the object but where did you get it from? sales and that sort of thing. Mother says it's something like £12.50. Cos what we've got here is the mark of C R Ashbee. from a point of view of silver. and then just that little plate. And right at the end of the wire, how it just spreads. that slightly rippley effect on the surface? Now that is what's known as the final planishing. so you had a small group of men working together. Each using their own particular skills to create the object. for the guild of handicraft. Any thoughts on its worth? Probably a bit more than £12.50, I would think. It's a beautiful piece. Right, certainly more than £12.50, at least £13. -be thinking 3,000, 4,000 quite easily. That mark is going to push it up cos it is so rare. And I think we're looking more around the 5,000 mark. Right, OK, that's, that's very, very nice. a couple from Hampshire who came to the rescue of the company when they got into trouble back in 1999. And they are Rosemary and Will Dorling. down in Hampshire, what was your connection with Burgess and Leigh? Portugal or the Far East, we just had a passion for English ceramics. -And is this jug part of the output? before we even knew about Burgess and Leigh. but how were you able to help? put an offer in for the business. again and this poor old factory would be left behind to the developers. and I'll arrange a commercial mortgage for you. Had we not met Peter in the street, we wouldn't today be in this wonderful factory. who gave their lives in horrendous conditions to make art. And is this something from your family? fairytales for the German soldiers to send back to their family. was he made this little set of a Polish fairytale called Maria the Orphan, for his niece. sent it back to her after the camp was closed. -set of these little very similar farmyard set in the 1950s. So they were obviously very popular then. I think my set in the '50s was slightly more rustic than this. so wonderful having all these, the geese, what was the story? It was about Maria The Orphan, it's similar to the English fairytale of Red Riding Hood. -If it was to sell, I could see it going for you know, £150, £200. But its value is ten times that. and amazing set and it's fabulous that it's stayed in the family. most years with my mum, when my grandfather was growing up. and painted in the 1920s perhaps, when did they have it, do you suppose? the family in India and he came back in the early 1930s. -And he'll have bought it new. -I think he'll have bought it then. picture, lovely bright colours, very quick paintwork and so on. It's a man who's really enjoying life I think, don't you? the end of the 19th century, 1899 to about 1905, something like that. outside and "plein air" painting and the Scots really picked up on this. so on, do you recognise this particular view? but he's no longer with us but I don't know that particular one. I just love this use of this bright splashes of colour which draw your eye into the picture. It's just absolutely full of life - it sings, doesn't it? somewhere between £30,000 and £40,000. Henry Sandon fans who simply wanted to kiss the great man. Well, he has been oozing charm and his great knowledge of ceramics for 29 of the show's 30 years. landed on the ceramics table have really changed people's lives. Yes, the biggest one I suppose came in Northampton. a slipware model of an owl made in Staffordshire. for many, many years I've never had the privilege of handling one. So it's a joy to have it. -I don't know what you or your father think it's worth. Any ideas? -Do you know what I think its value is? Are you comfortably sitting there? Something between about £20,000 and £30,000. "He came out of his nest and is now roosting in Stoke-on-Trent. "From Mrs Owl and the Owlets", it's lovely. Henry Sandon, This Is Your Life, do you remember that by any chance? It was a dreadful shock I nearly died. And now I have this wonderful book with them all, my history inside it. -That was a happy day wasn't it? -It was a very, very happy day, I've never forgotten it. have a very special relationship all the way from the Potteries Museum himself. Ozzie the Owl. -thank you, thank you very much. "Be all right with the freak and funky Jimi Hendrix", classic. Jimi Hendrix's drummer. How d'you happen to have these? -outside on the stage door, me and my friend. The Gaumont at Hanley and this was the bill that he was on with the Walker Brothers. becoming more infamous at every gig that he played. So, what was he like then, to watch? What was he like? Well, we didn't actually see him play. we couldn't afford to go in. So we just waited at the stage door. -Terrible thing to ask a lady, how old were you? -I was 15. My friend was 14.
following Jimi and his entourage. You gave pursuit after Jimi Hendrix's guitar? person and actually got the guitar back. what's this, this bit of Beano? the ring, he took the ring off his finger. -So he gave you that? -Looks like something out of a Christmas cracker. -Can I have a look at it? at the time that was not important. Hold on a sec, I've got to wear it. It's just like him, he was flamboyant. Well, I'm quite flamboyant as well. Do you think it suits me? It's a little bit small for me, it fits on my little finger. it's not quality that's important here - that's Hendrix's ring. Had you ever thought about what a little thing like this is worth? I think the whole lot is going to make £500 to £700 at auction. So it's a great little thing. And I have to say, the story makes it. Thank you very much. I went to a market and I saw it on a stall and I liked it. I thought it had no particular value but it was aesthetically pleasing. -And you purchased it for how much? It was the enamel that appealed as well and the signature. Signature. I thought the signature was slightly familiar to me. Rhead - it's there, something's in the conscience? with the 1920s and '30s and the Art Deco period. working here at Burgess and Leigh. we're looking at a date fairly specifically between 1908 and 1910.
at the Atlas Tile works. you'll also probably have heard of, Louis Solon, at Minton. and I'm so glad you brought it along today. Someone I didn't expect to see at the Roadshow today is Nick Hancock. Surely you've got better things to do than come and see us. Only cos it's shut, yeah. -So why are you here. the team I support, so I'd be interested to know what you think. You've been a Stoke City man and boy, all your life, haven't you? and my father, so yes. was many years ago, we did a show in Trentham. and it was absolute magic. but he was a massive name, and he was from Stoke on Trent. OK, so, are these to do with him? Some of them are, yes. because the whole of the nation had been willing Stanley to win. He had to do it. He'd never done it. He'd never won anything up till then. -because this is a medal he won when he was at Stoke City. When they got promotion in 1963.
is probably slightly more important to me because that as a Stoke fan. -And that's real Roy of the Rovers stuff. while they had a breather, it was a fantastic story. So you collect memorabilia football stuff? but it just makes it slightly more tangible to have something there. I think things that have been part of someone famous are just magic. it's a Gordon Banks cap. we used to go on tours round the world, because Stanley was playing. Gordon Banks, another iconic player. Yes, it wasn't a great World Cup. for the game we lost. -The greatest save of all time. -OK, so you collect these things, you buy them. And they're expensive, aren't they? Like a lot of Stoke on Trent people I'm quite nosey, I'll go to the sale with no intention at all of bidding. As we all do, but suddenly your hand creeps up. "That should be staying in the city." Yeah, OK. Can we ask? The cap is in the thousands rather than the hundreds. Now, just below 10,000 I would have said. -and yet strangely, the thing I cherish most. Yes, that's a very expensive medal that, tens of thousands probably. they're important things, they're important to you. I think iconic things like that will hold their price. Now I'm gonna say to you, you thought it was all over, but, stop. -Hang on a minute. I've got a present for you. Stoke City, I think it's 1961, versus Liverpool. How fantastic, thank you very much, that's wonderful. -Well, it's better in your collection than in mine. that we've got a portrait of William Gladstone, cos he didn't live that far from here. About 30-ish miles, I think. -Just inside the Welsh border. And, and where did you find him? Antiques fair in Chester, Chester racecourse. -Oh, really and you just came across this. -Yeah, just lying on the floor. What did it look like when you first encountered the man. and we're just delighted with it. So have you attempted to find anything out about it? -Yes. Obviously, that's fairly prominent. -Which looks like a cipher. Yes, and we have no idea, we looked on the internet, couldn't find it. but that was it, we drew a blank. a little bit more about it. OK.
who is an extremely interesting artist. got to the Royal Family, got to people like William Gladstone. he in a sense epitomises the grand Victorian face. but that's not surprising because he was really into his face. Disraeli understood the power of personality, the personality cult. portraits like this, they managed to get their image around. loved adversity, he loved to confront. you know, he didn't talk gently, he just sort of lectured you. in Victorian England, together with Disraeli. Politically, they reigned supreme for a bit, one way and another. it's an emotive period in his life. when something exciting is happening. Weigall is an artist who is rated. so I'm reasonably familiar with the artist. Can I ask you what you paid for it? so we spent a total of about £700 altogether. at anywhere up to £20,000. we don't really know what it is, but it's what we call a street piano. and you can imagine people in a parlour circa 1900, sitting there with this piece playing. What's the story behind it, where did you acquire it? It was acquired from my grandmother and it was left to me son. And it won't fit in my house so it's stored in the workshop. -It's the first time it's been out in 3 years. So it's your responsibility, but it belongs to you. Right, OK. And what do you think of this, do you like it? I love it, it's really... I like the panels. The panels are spectacular, aren't they? when in fact, actually, it was a fairly cheaply made thing. I can only just make that out. up the top. That is not original to this piece of furniture. was then obviously later put perhaps into a cafe or something like that. And now's the point at which we should open it because we can look at those sort of things. What I'm going to do is have a look at this very carefully. and put it to one side. motor in the back, obviously operate the hammers as the pins pass. obviously is the place of which the frame was made, essentially. -Do you know how many tunes it plays? Think it's eight, but I can't be sure on that. Often these machines do have what we call eight airs or eight tunes. Because obviously these rows of pins are in fact different tunes. I think 2,000 to 3,000 at auction would be a nice estimate for it. Having said that, I think we should run it. I have no idea how to get it going. Do you know how to get it going? -Right, OK, you're gonna have to show me, where do we start? I think you have to turn the handle down here. Right, OK, do you want to wind up the handle for me. That's the clockwork handle, is it? Try it again. Bit more. These are a curious pair of bowls, were did they come from? and thought they were nice, he liked them. -Moss. Is that the receipt? -It is the original receipt. Well, we love bits of paper because they're always wrong! K'ang Hsi Period 1662 to 1722. Well, that's what they said. We don't know whether that's right yet. And he paid in 1947, £105. -He could buy a house in London for that. I like the red lining contrasting with the black. OK, you say red lining, let's have a look. Well, we would call that coral. -Yes, it is a coral colour. The combination of black and coral is actually quite rare. -You see this on porcelain extremely rarely. Extremely rarely. They are made of porcelain, hard paste porcelain. put on top and then fired again at a slight lower temperature. which is often in red and black, I think it's probably that. on these lotus carved ivory stands. I've never seen stands like that. -Never, they are absolutely fantastic. engraved with four Chinese characters. "precious pavilion of the calm studies". It's obviously a reference to your house. rather than it getting lost, that would be a great tragedy. And that's ones lost it. I mean, that's what happens. -Lost when we had it. -I'm quite happy with the dating of K'ang Hsi. very late 17th, early 18th century, right on the cusp of that period. all the work that's gone from here, where's it gone, it's gone to China. they were the leaders in the 18th. So, it all goes round in circles. This is exactly what they'd like. Do you have them insured? quite honestly, difficult coming up with a justifiable estimate. in coming up with an estimate of £10,000 to £15,000. I would, I think they're wonderful. You'll never see another pair. and the Potteries have always produced plenty of that. Oliver Lodge, who invented the spark plug, he was a local man. was E J Smith who went down in history as the captain of the Titanic. and from Middleport pottery, goodbye. 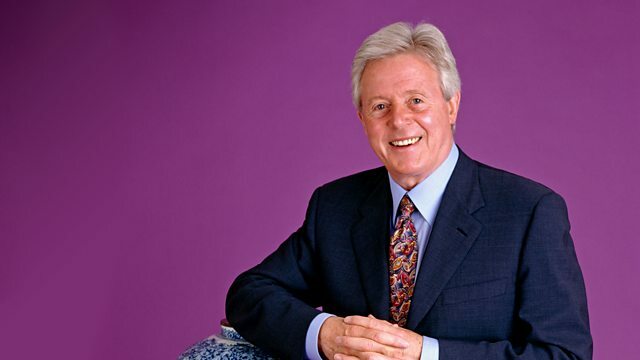 Michael Aspel and the team survey antiques and heirlooms at the last working Victorian pottery in England, at Middleport in Staffordshire. A lost portrait of William Gladstone puts in a surprise appearance, and a pendant purchased for 50p at a boot sale turns out to be worth quite a bit more. Also, a pair of rice bowls turn out to be worth thousands of pounds.